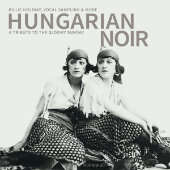 Various - "Hungarian Noir - A Tribute To The Gloomy Sunday"
It is the world's deadliest song, a musical composition so lethal that merely to hear it hummed may induce suicidal tendencies. It is "Gloomy Sunday", public menace of such potentially epidemic proportions the BBC was compelled to ban it for decades. Indeed, if contemporary news reports and eyewitness accounts are to be believed, no other song comes close to it for sheer morbidity.